of dying necrotic blind mole rat cells. Photo by Andrei Seluanov/University of Rochester. Biologists at the University of Rochester have determined how blind mole rats fight off cancer�and the mechanism differs from what they discovered three years ago in another long-lived and cancer-resistant mole rat species, the naked mole rat. The team of researchers, led by Professor Vera Gorbunova and Assistant Professor Andrei Seluanov, found that abnormally growing cells in blind mole rats secrete the interferon beta protein, which causes those cells to rapidly die. Seluanov and Gorbunova hope the discovery will eventually help lead to new cancer therapies in humans. Their findings are being published this week in the Proceedings of the National Academy of Sciences. Blind mole rats and naked mole rats�both subterranean rodents with long life spans�are the only mammals never known to develop cancer. Three years ago, Seluanov and Gorbunova determined the anti-cancer mechanism in the naked mole rat. Their research found that a specific gene�p16�makes the cancerous cells in naked mole rats hypersensitive to overcrowding, and stops them from proliferating when too many crowd together. "We expected blind mole rats to have a similar mechanism for stopping the spread of cancerous cells," said Seluanov. "Instead, we discovered they've evolved their own mechanism." 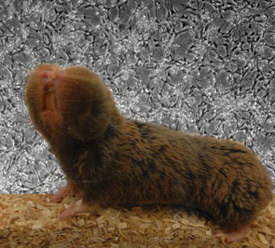 Gorbunova and Seluanov made their discovery by isolating cells from blind mole rats and forcing them to proliferate in culture beyond what occurs in the animal. After dividing approximately 15-20 times, all of the cells in the culture dish died rapidly. The researchers determined that the rapid death occurred because the cells recognized their pre-cancerous state and began secreting a suicidal protein, called interferon beta. The precancerous cells died by a mechanism which kills both abnormal cells and their neighbors, resulting in a "clean sweep." "Not only were the cancerous cells killed off, but so were the adjacent cells, which may also be prone to tumorous behavior," said Seluanov. "While people don't use the same cancer-killing mechanism as blind mole rats, we may be able to combat some cancers and prolong life, if we could stimulate the same clean sweep reaction in cancerous human cells," said Gorbunova. The research team also included Christopher Hine, Xiao Tian, and Julia Ablaeva in Rochester, Andrei Gudkov at Roswell Park Cancer Institute in Buffalo, NY, and Eviatar Nevo at the University of Haifa in Israel. Gorbunova and Seluanov say they next want to find out exactly what triggers the secretion of interferon beta after cancerous cells begin proliferating in blind mole rats. Gorbunova believes the anti-cancer mechanism is an adaptation to subterranean life. "Blind mole rats spend their lives in underground burrows protected from predators," said Gorbunova. "Living in this environment, they could perhaps afford to evolve a long lifespan, which includes developing efficient anticancer defenses."